So many brilliant and renowned theologians and teachers have graced the campus of St. Vladimir's Orthodox Theological Seminary over its 80-year history. We are so pleased that now you can literally hear their voices in lectures and talks that had been in danger of being lost or forgotten. Hundreds of old analog recordings of Fr. Alexander Schmemann, Fr. 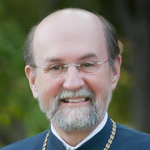 John Meyendorff, Metropolitan Kallistos Ware, Fr. Thomas Hopko, Sophie Koulomzin, Jaroslav Pelikan, and many, many others are now available--for the first time--in digital, online format you can listen to anywhere, anytime for free. Create a free account.